Okay, this sounds like complete fun. Check out Indexing (Kindle Serial) by Seanan McGuire. Any book description that includes "they are tasked with identifying potential outbreaks using the Aarne-Thompson Indexing" is completely fun. And we won't quibble that it's ATU with Uther added, will we? Because this is cool nerdy fairy tale fun all the way... (After all, there are still parts of SurLaLune that haven't been updated with the ATU numbers either.) And the entire serial is a $2.99 commitment. Not much of a financial risk.. This book is a Kindle Serial. Kindle Serials are stories published in episodes, with future episodes delivered at no additional cost. This serial currently contains one episode out of an estimated twelve total episodes, and new episodes will be delivered every two weeks. Last week I got to spend a few hours researching more upcoming fairy tale titles--yes, most of these are still listed through hard research on my part, not notifications!--and realized I reached the maximum on the Amazon Listmania lists, a tool I use to create the book widgets on the blog and site. In other words, there are at least 55 new releases in fiction this year. I created two lists for fiction alone and will keep adding to them as I discover more. I've created slideshow widgets here, but here are also direct links to the lists: Fairy Tale Influenced Fiction 2013 Part 1 and Fairy Tale Influenced Fiction 2013 Part 2 . There are also lists for picture books and nonfiction but I'll address those in separate posts later. I've also started to get a headstart on 2014 releases! Biggest upcoming trend? Snow Queen thanks to Disney's Frozen. While that should not be surprising, it wasn't the trend for Tangled/Rapunzel or Frog Prince when those movies were released. Some marketing people are finally paying attention. Stroke of Midnight by Olivia Drake will be released next week on June 4th. This is the second in a romance series by Drake with the previous and first title being If the Slipper Fits (Cinderella Sisterhood) , which was released last summer. The entire series is inspired by Cinderella it appears. The infamous Laura Falkner has returned to London society in disguise. Determined to clear her father's name, she becomes a companion to elderly Lady Josephine—only to learn the woman's nephew is none other than Alexander Ross, the devilish Earl of Copley, the man Laura once loved with all her heart. The same man who’d accused her father of theft and forced them to flee England. Alex has never forgotten Laura—or forgiven himself for letting her go. Today, Laura is as lovely—and stubborn—as ever, and her attempts at crime-solving are putting her in danger. The only way Alex can keep her safe is to marry her. But how can this notorious rake convince Laura that his heart is true…before the clock strikes twelve? 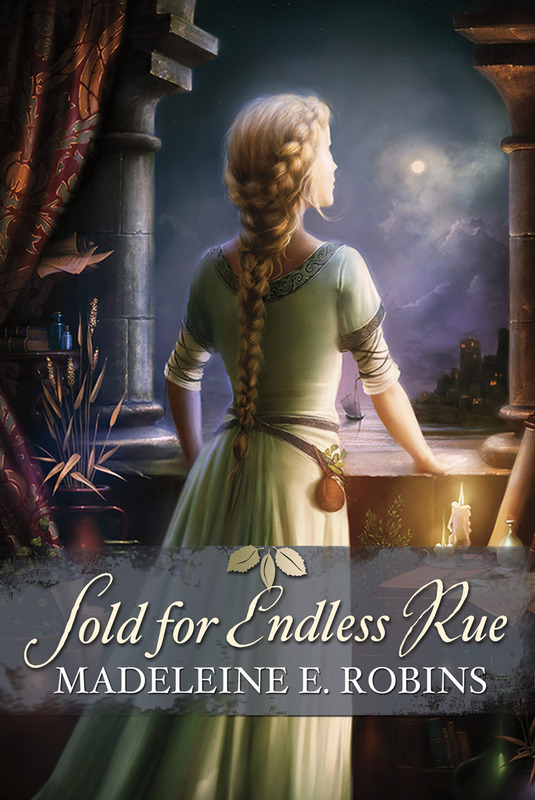 Sold for Endless Rue by Madeleine E. Robins was released last week. It's one I missed on my lists but SurLaLune reader Jennifer S. emailed to let me know about it. And I even own other titles by Robins--not fairy tale related, but mysteries--so this was a new surprise for me! And we all know that Rapunzel isn't reinterpreted as often as other fairy tales, so this is another treat. After a blighted childhood, young Laura finds peace and purpose in the home of a midwife and healer. Later, she enrolls in Salerno's famed medical school—the first in the world to admit women. Laura and her adoptive mother hope that Laura can build a bridge between women's herbal healing and the new science of medicine developing in thirteenth century Italy. The hardest lessons are those of love; Laura falls hard for a fellow student who abandons her for a wealthy wife. Worse, her mother rejects her as "impure." Shattered, Laura devotes herself to her work, becoming a respected medico. But her heart is still bitter, and when she sees a chance for revenge, she grabs it—and takes for her own Bieta, the newborn daughter of a woman whose husband regularly raided the physician's garden for bitter herbs to satisfy his pregnant wife's cravings. Bieta's betrayal of her mother's love comes at a terrible price as lives are ruined and families are torn apart. Laura's medical knowledge cannot heal her broken heart; only a great act of love can bring everyone forgiveness and peace. And you can read an article about the book by Robins at The Big Idea. Where she shares her love for Paul O. Zelinsky's Rapunzel (Caldecott Medal Book) . Lovely all around! As happens with these sorts of bolt-from-the blue notions, it sat around gathering dust-bunnies and stray factoids while I wrote other things. I began cursorily reading up on daily life in the Renaissance, thinking of ways to rehabilitate the witch. Maybe she’s a midwife? At least that would give her a reason to be in the room when the baby was born. But why take the kid? And then I stumbled across a factoid that rewrote my whole idea of the middle ages and, by the way, this story. The first medical school in Europe, the Scuola Medicina Salernitana, not only had women as students, but women instructors. One of the most famous, Trotula di Ruggiero (immortalized in the Jack and Jill rhyme as “old Dame Trot”), specialized in women’s medicine–what we’d call OB/GYN. Her texts on the subject were in use for centuries. Dame Trot was not a damsel or a peasant. She was a professional woman. How cool is that? And cause I have great love for Zelinsky's Rapunzel, here's an image. Amazon has the look inside feature for this one if you need a taste of Italian Rapunzel today. TODAY ONLY: Lud-in-the-Mist (Prologue Fantasy) by Hope Mirrlees is bargain priced in ebook format for $.99. This book appears on many highly recommended lists and has been recommended to me over and over through the years in discussions with other readers as well as conferences. In other words, you don't have to take my word for it that it should be in your personal library. I bought it at a higher price years ago so here is your chance to get it for less than the price of a soda. The book that New York Times bestselling author Neil Gaiman considers "one of the finest [fantasy novels] in the English language"
Kingdom Keepers: Disney After Dark (The Kingdom Keepers) by Ridley Pearson is bargain priced today for $2.99. There is a pattern this week since I already shared another book set in a fairy tale inspired theme park. See my post New Release: How Zoe Made Her Dreams (Mostly) Come True by Sarah Strohmeyer. Anyone know of a third since more things come in threes? In this fantastical thriller, five young teens tapped as models for theme park "guides" find themselves pitted against Disney villains and witches that threaten both the future of Walt Disney World and the stability of the world outside its walls. Using a cutting-edge technology called DHI--which stands for both Disney Host Interactive and Daylight Hologram Imaging--Finn Whitman, an Orlando teen, and four other kids are transformed into hologram projections that guide guests through the park. The new technology turns out, however, to have unexpected effects that are both thrilling and scary. Soon Finn finds himself transported in his DHI form into the Magic Kingdom at night. Is it real? Is he dreaming? Finn's confusion only increases when he encounters Wayne, an elderly Imagineer who tells him that the park is in grave danger. Led by the scheming witch, Maleficent, a mysterious group of characters called the Overtakers is plotting to destroy Disney's beloved realm, and maybe more. This gripping high-tech tale will thrill every kid who has ever dreamed of sneaking into Walt Disney World after hours and wondered what happens at night, when the park is closed. Have you been looking for an affordable copy of The Slipper and the Rose or Cinderella (Leslie Ann Warren/1964) on DVD? The used prices are close to $100 on average for the out of print titles. Santa Flix, a small company in California, apparently has the rights to sell these and you can buy them directly for much more reasonable prices. The Slipper and the Rose is $22.95 and Cinderella is $24.95. That's considerably less than the prices on Amazon or eBay. Seriously. Search for either title on either site and you will be shocked. Or not when you consider that these are cult classics. I haven't any experience or affiliation with Santa Flix myself although I placed my own order with them a few days ago for the long sought A Town Like Alice, a family favorite that John and I enjoy watching together. (Seriously, a DVD edition has been on my wishlist for over a decade.) So I will be seeing what their products are like soon enough. There are lots of titles on their site and I imagine one or two will interest you, fairy tales or not. I already own the original Slipper and the Rose DVD release which I adore. It and Ever After: A Cinderella Story are my favorite Cinderella films. I was tempted to buy this one to review it, but my budget doesn't stretch that far this summer for something I already own. 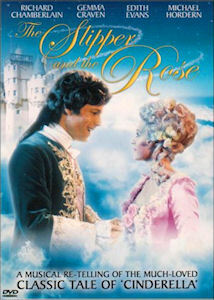 And if you haven't seen Slipper and the Rose? Well, you need to love musicals. But if you do, this should fit the bill nicely. The Sherman Brothers--better known for Disney's Mary Poppins and The Jungle Book--wrote the music. And this is one of the few Cinderellas where there isn't an immediate happy ever after--there is concern that she is a commoner and that the prince's marriage isn't political. And Annette Crosbie's fairy godmother is so very traditional but then again not. Love her! If I had a fairy godmother, I imagine she'd be like Annette Crosbie. 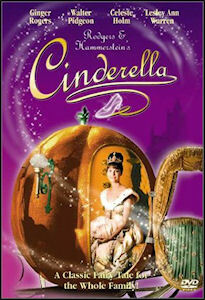 And the 1964 version of Rodgers and Hammerstein's Cinderella is a classic, too. I think of it as the "middle one" between the Rodgers & Hammerstein's Cinderella (1957 Television Production) with Julie Andrews and the Rodgers & Hammerstein's Cinderella (1997) with Brandy and Whitney Houston which is just too glittery for my taste. Warren makes a much more traditional princess than Andrews. I prefer Andrews myself, but Warren beats Brandy for me. How Zoe Made Her Dreams (Mostly) Come True by Sarah Strohmeyer was released in April. This is a more unusual offering of a "fairy tale" themed book on the blog since it is a YA novel set in a fairy-tale themed amusement park inspired by Disneyland. Sounds like a light summer vacation read, especially for those planning a trip to a Disney park. In YA novel How Zoe Made Her Dreams (Mostly) Come True, Zoe learns there is a dark core under the glittering façade of the fairy-tale themed amusement park (cough, Disneyland, cough) where she’s a summer intern. For starters, her boss has a blacker heart than Snow White’s stepmother, and the other interns are worse backstabbers than Cinderella’s step-sisters. On the upside, she has the chance of romance with a real-life Prince Charming, and a shot at winning a big heap of cash. If she can just live through a summer in the Fairyland Kingdom. Strohmeyer is no stranger to fairy tale themes either with previous adult titles like The Cinderella Pact and The Sleeping Beauty Proposal . Handbook for Dragon Slayers by Merrie Haskell is released next week. This is Haskell's second book, following her popular The Princess Curse , a favorite of SurLaLune readers. It's not a strict fairy tale retelling this time but uses fairy tale inspiration. Like Gail Carson Levine’s books, Merrie Haskell’s middle-grade fantasy / adventure Handbook for Dragon Slayers mixes magic, mythical creatures, thrilling action, and a wonderful cast of characters. Political upheaval sends Princess Tilda fleeing from her kingdom in the company of two hopeful dragon slayers. The princess never had any interest in chasing dragons. The pain from her crippled foot was too great, and her dream was to write a book. But the princess finds herself making friends with magical horses, facing the Wild Hunt, and pointing a sword at the fire-breathing creatures. While doing things she never imagined, Tilda finds qualities in herself she never knew she possessed. Handbook for Dragon Slayers is a deeply satisfying coming-of-age tale wrapped in a magical adventure story. Since I'm a sucker for books that use nursery rhymes/finger plays as well as fairy tales to form their plot, I had to share that Amazon has the ebook version of Five Little Pigs (Hercule Poirot Mysteries / Queen of Mystery) by Agatha Christie bargain priced today only for $1.99. It'll be back to $6.99-7.99 tomorrow. I've not read this one--and am admittedly not a Poirot fan (I know, shame on me)--but this will make a great distraction the next time I'm stuck in a line somewhere. I'm also gradually building up my Christie library as they are bargain priced. My favorites--the Tommy and Tuppence books--keep staying full price however. Hard to justify when they sit in paper on my shelf. And my oldest niece is a few years away from enjoying these so I'm stockpiling for her, too. Yesterday the 2013 Mythopoeic Award Finalists were announced. This year's crop is less dominated by books with direct fairy tale inspiration excepting the finalists for Children's Literature. So I will share that entire list and then send you to the site for the other categories. Fairy Tale Queens: Representations of Early Modern Queenship (Queenship and Power) is also on the lists with a reminder to me that I really want to explore that one. 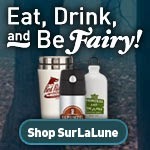 Congrats to all the finalists, many of whom are beloved authors on SurLaLune.